As we rode up the gentle climb of Larson Lake Road, I looked at my companions, Hahn and Ryan. Both had smiles on their faces. The road ahead was winding it way through the trees. The sun was shining through the canopy, creating a dazzling spectacle of light and shadow on the pavement. We had not seen a car in quite a while. Ryan expressed what we all had been thinking: “This is fun!” Fun to ride our bikes on a beautiful road, but also fun to live the adventure that we had planned so long. Just four hours earlier, I had been riding through Friday evening’s rush-hour in Seattle. Cars were lining up at traffic lights with little hope to make the next light cycle. The Monorail glided overhead as I dove into the canyons of downtown’s high rises. My handlebar bag loaded with spare clothes and food for more than 500 km on the road. I had the sensation of being a traveler, a stranger immersed into a foreign world. Antoine de Saint-Exupéry described this in his writings about early airplane pilots: They are fascinated by the places they visit, but they always are outsiders, and their thoughts already are on their next voyage. Ryan, Hahn and I met at a “healthy fast food” place for a quick dinner, before boarding the ferry to Bainbridge Island. The ferry ride allowed us to digest our dinners, and leave the bustling city behind. On the other side, we waited for what seemed like an eternity until the ferry had disgorged its cars. After having our cards signed at a bike shop, we clipped into our pedals at 5:31. With the ferry traffic ahead of us, we made good progress on the empty roads across the island. After crossing the bridge at Agate Passage, we turned onto small sideroads. Every time, the steep, short hills past Suquamish come as a rude surprise, but our goal was not to maximize the distance we rode – that would have involved a flatter route – but to ride on interesting sideroads. Our initial enthusiasm saw us ahead of the faster of our two schedules as we stopped at our first control in Port Gamble. This did not last long. 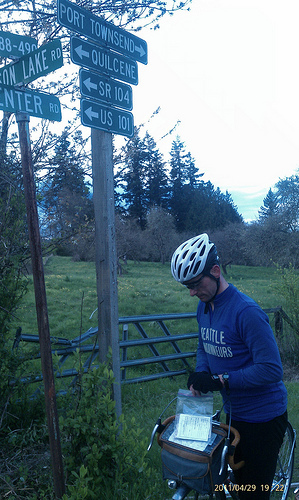 The hills around Eaglemount on the Port Townsend peninsula brought our speeds down to the planned rate of progress. Backroads meander, and randonneuring rules require controls whenever there might be a short-cut, so we stopped at various intersections and took photos of ourselves with street signs as proof of our passage. Past Eaglemount, an exhilarating descent brought us to the Route 101, the main highway around the Olympic Peninsula. Through careful map reading, we had charted a course along old roads that avoided the highway as much as possible. Even so, the first three kilometers on the highway shoulder already netted a flat on my rear tire: A long steel wire from an exploded truck tire had made short work of my tire and tube. I was able to limp onto the backroad, so we could change the tube in a tranquil setting while the sun vanished behind the hills to the west. 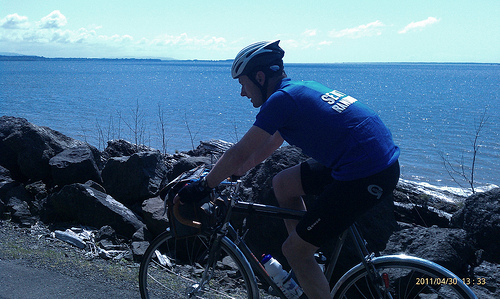 After this minor disruption, we attacked the rollers toward Sequim with renewed vigor. The weather forecast had been optimistic, predicting a complete break from Seattle’s sodden spring weather. Furthermore, Sequim is known as the driest part of western Washington, located in the rain shadow of the Olympic Mountains. Not tonight: Dark clouds loomed ahead, and soon the skies opened. We appreciated our fenders and mudflaps as we rode through the downpour. There was no lightning, but we clearly were dealing with a convective shower as airmasses rose above the Olympic Mountains. After a quick resupply in Sequim, we left the rain behind, but the convection over the mountains meant that we had to battle a tremendous headwind. Delayed by these forces of nature, we arrived in Port Angeles close to our “slow” schedule. 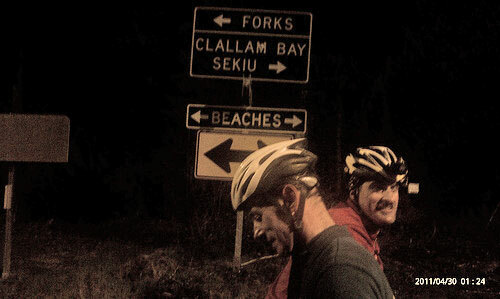 We stopped for almost ten minutes to stock up on supplies for the long night ahead, then we headed out onto the dark roads along the Straight of Juan de Fuca. These roads are wonderful at any time, but in the dark, they were truly special. Multitudes of stars sparkled above the tree tops. The road climbed a little pass, followed by a fast descent. With our Edelux and IQ Cyo headlights, we could let the bikes roll, enjoying the sweeping descent in the aero tuck before braking sharply for a number of hairpin turns. Back at sea level, we heard the waves of the Strait of Juan de Fuca crash onto the beach, louder than usual because of the strong wind. Without a moon, we never saw the water, but hearing it from time to time in the otherwise quiet night was delightful. We rode through a winding valley, the trees along the road picked out in the periphery of our headlight beams. We passed through Pyscht, which was fast asleep at this hour. Another long climb followed, with another rain shower to keep us awake. A fast descent brought us back to the main road, and on to Forks. During our first Flèche, we had spent an inordinate amount of time at the only convenience store of this logging town due to fatigue and cold, but tonight, we were dressed for the weather. Our stop was efficient, and quickly, we were back on the road. We rode through the foothills of the Olympic Mountains as we approached the Pacific Ocean. Soon a tiny silver band above the horizon announced the dawn of the new day. With renewed vigor, we picked up the pace. It was already light when we heard the ocean surf below us. We stopped at an overlook on the cliff, looking down onto the sandy beach and the limitless ocean beyond. Having cycled overnight from Seattle to the western edge of the North American continent always is a great feeling of accomplishment. We rode along the cliff, catching glimpses of the ocean through the trees. We passed Klaloch without stopping, then turned inland toward Lake Quinault. Our schedule provided two alternatives for this stop. If we were making extremely good progress, we would have arrived before the restaurant at the historic National Park lodge opened, and would have continued immediately. Our pace had been only average, so we arrived ten minutes after the restaurant opened. We decided that a longer stop would be beneficial. We sat down at a table with a great view of the lake and ate a hearty breakfast. Service was unusually fast, and after only 40 minutes, we were on our bikes again. Our stomachs were filled with real food, our legs rejuvenated from not having to bear our weight, and our minds were fresh for the long day ahead. We rolled along at a good clip on Highway 101, the main road around the Olympic Peninsula. The road surface was rough chipseal, while the shoulder was smoother. Hahn succumbed to the temptation of riding on the smooth shoulder. Almost immediately, he paid the price with a flat tire. From then on, we rode in the traffic lane. There were few cars on the road, so it was easy to move over when one approached from behind. 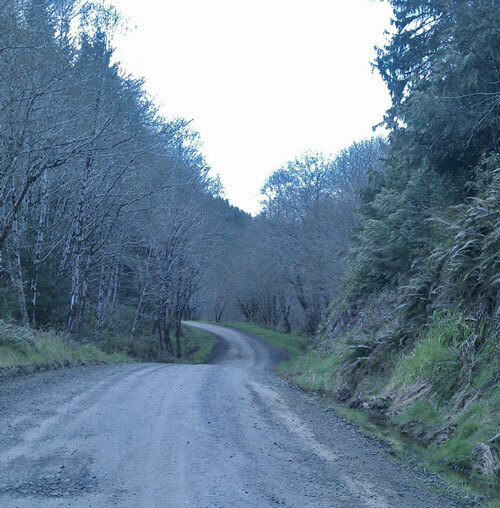 Before long, we turned off the highway onto Hoquiam Road, a beautiful backroad that wound its way through the hills. We had scouted this alternative to the highway on Google Earth, and it turned out to be even nicer than we thought. Aberdeen was the antithesis of the unspoilt landscape we had been experiencing so far. We quickly checked into a convenience store, crossed the mighty Hoquiam River, and then left the strip malls and oversized streets behind. Riding west to the coast at Westport, we faced a tremendous headwind. Traffic was heavy enough to be bothersome, and we enjoyed a little sideroad for a few miles, even after it turned to coarse gravel. Our toils into the wind were rewarded when we turned south to ride along the coast. Pushed by a tailwind, we flew through the beach communities with their small shops, restaurants and sand dunes. We admired the brand-new windmills on top of the hillside as the road edged closer to the water. 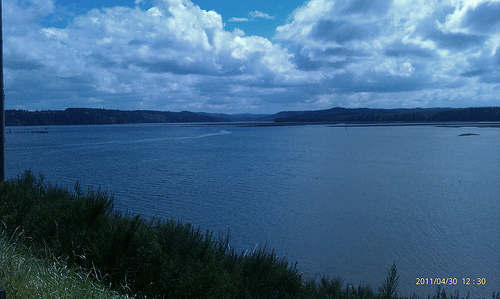 Ahead of us was the marvelous panorama of Willapa Bay, one of the largest estuaries on the North American Pacific coast. The flat road and tailwind allowed us to rest our legs and restore our spirits, while making up a little time on our schedule. On we went, onto the lovely gravel road. We were enjoying the ride until we came to the first sharp corner. Here, coarse gravel similar to railroad ballast had been spread over the road, probably to prevent the rally cars from destroying the road underneath. As we picked our way through the rocks, a pickup truck with flashing lights approached from behind and stopped next to me. The driver said: “You can’t ride here. There is a car rally coming through soon.” I replied “When will the cars arrive?” – “In about an hour, and you have five miles to go.” – “We ride at about 15 mph, so we should have no trouble.” – “Except your friend, who has a flat tire back there.” I looked back, and indeed, Hahn was removing his rear wheel from the bike. Oh, no! The rally volunteer suggested a solution: “Continue, but when you see a car with the numbers 00, get off the road immediately. The real rally cars will follow soon thereafter.” Knowing what speeds rally cars can achieve on these gravel roads, I nodded my head. “Do you need some water,” the friendly official asked, before driving off in a cloud of dust. Ryan had gone ahead during this exchange, and Hahn was almost ready to continue. 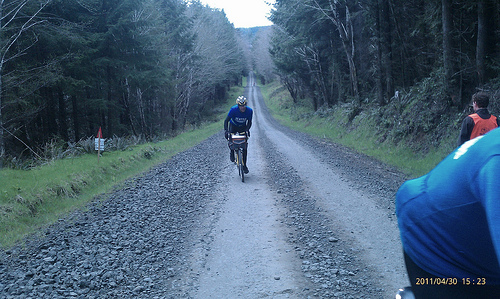 From then on, we walked the sections with the coarsest gravel. Hahn’s 29 mm Challenge tires definitely weren’t up to this, and my Grand Bois 32s barely could make it. Not for the first time on this ride, we envied Ryan’s 42 mm wide Grand Bois 650B tires, which coped much better not just with the gravel, but also with the chipseal we had encountered earlier. We tried to make up time whenever the road was smooth. On the hillsides above the road, numerous spectators were waiting for the rally. They were surprised to see silent cyclists sweating up the hills instead of noisy rally cars, but they cheered us on all the same. After a few kilometers, Hahn suffered a second pinch flat. We both were out of spare tubes now, so I patched two tubes with glueless patches while he removed his tire. Every moment, I expected the “00” car to appear, ending our ride for good. Half-way through this section, our 22nd hour arrived. We had covered 508 km so far, but now we had to ride another 25 in the last two hours to qualify for the Flèche. This simple rule was instated because some riders only rode the minimum distance of 360 km, and then stopped their ride, rather than riding for 24 hours in the spirit of the event. For us, this meant that we had to beat the “00” car, lest we be trapped at the side of the road until after our ride officially was over. We worked hard on the uphills, and let the bikes roll on the downhills, unless there was more coarse gravel that forced us off our bikes. (Ryan had no problems riding these sections, but his tires contain 70% more air than even my 32 mm ones.) 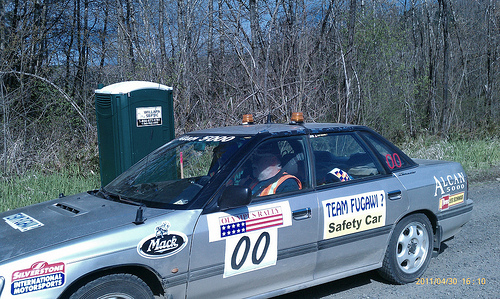 Finally, we saw another road block, and behind, a silver Subaru with the numbers “00” was idling already. Two rally cars had lined up behind, and a third one just arrived from the transfer stage on the open road. We had made it, but only barely! 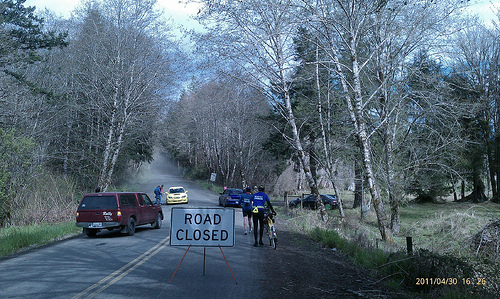 Ryan had bad news: “The road ahead is closed for another stage. We might just as well stop here.” Well, we made it through the last closed section, so we had to try our luck again. The stretch to Brooklyn is on a most beautiful winding road, usually completely devoid of traffic. This evening, there was a little more traffic than usual. Almost exactly one minute apart, a garishly painted rally car, festooned with sponsors’ logos, burbled the other way at the 25 mph speed limit. Clearly, the rally was in full swing. We still made good progress on the smooth pavement. 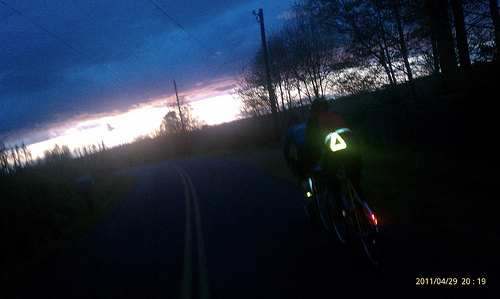 We soon passed through Brooklyn and arrived at our final gravel section of the ride. 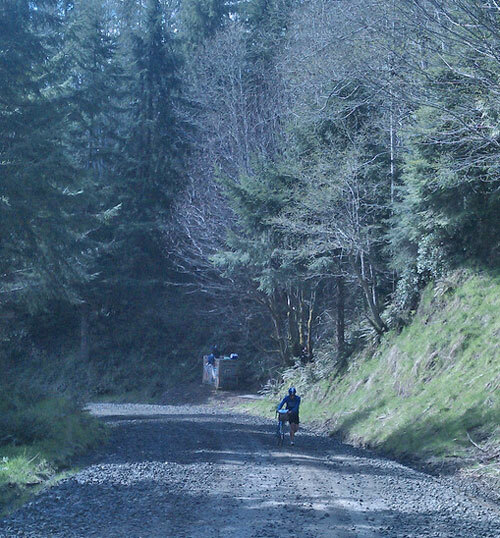 This gravel section also was another special stage for the rally. As we approached our third road block of the day, a rally car roared around the corner ahead, wiggled this way and that way as it braked on the loose surface, before coming to a stop in a huge cloud of dust. The navigator handed the control card to the officials who signed it, then the car continued at legal speeds to the next special stage. Fivehundredtwentyfive kilometers is a satisfactory distance for a Flèche, and well within 80% of our 575 km “goal,” but the pesky “2-Hour” rule required that we ride at least eight more kilometers before the 24 hours were over. We probably could plead extenuating circumstance, and in any case, our ride had been wonderful, whether we got a medal or not, but our sporting spirit wanted us to finish the ride honorably. We spied a sideroad, and figured we might be able to follow that for 8 km, before the 24 hours elapsed. 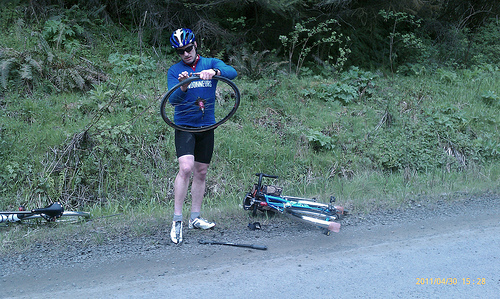 Unfortunately, it ended at a farm after just a quarter of a mile, but not before Hahn had another pinch flat. Just as our spirits were at a low ebb, the volunteer came over and said that the last car just had gone through. Once the various official cars had passed, we could go. “But watch out, there are 5000 spectators up there, and many have been drinking.” So it was: As we embarked on the final leg of our trip with just 25 minutes to go, we faced a steady stream of cars coming the other way. To think that usually this is the least trafficked part of this route. We sprinted up the gravel climb amid clouds of dust, and managed to squeeze 9 km into the remaining time, before we stopped near the top at 17:30! Success. 534 kilometers! Everybody felt elated, but now we had the small matter of completing the remaining 55 km to Olympia. We now had left the special stage, and spectator’s cars were passing us on the narrow road. At the same time, fire trucks and ambulances came the other way, and race officials’ cars roared in either direction. Unbeknown to us, a competitor had crashed, plus a spectator had suffered from alcohol poisoning... In this mayhem, we decided to pull off for a while and direct traffic in a blind corner, rather than add to the confusion. After a while, we finally escaped onto bucolic backroads to Oakville, where we had dinner at a Mexican restaurant. We were dreading the long way into Olympia, but it turned out to be a beautiful ride in the evening light, pushed by a light tailwind on the most lovely little roads. Almost out of nowhere, we rode under the freeway and found ourselves on “Auto Mall Boulevard.” Fortunately, we only had to ride a few blocks through the strip malls before we reached the Red Lion Inn at 9:45 p.m. We had ridden 600 km in 28:15 hours, and almost every one of them had been enjoyable. We now look forward to the Flèche 2012. Epilogue: A few days later, we found out that the competitor who crashed during the Olympus Rally died from his injuries. The last stage of the day was cancelled as a result. “What a dangerous sport,” Ryan exclaimed. Then we read that this was the first fatality in North American stage rally competition since 2003. Sadly, our gentle sport of randonneuring has seen more fatalities than that.